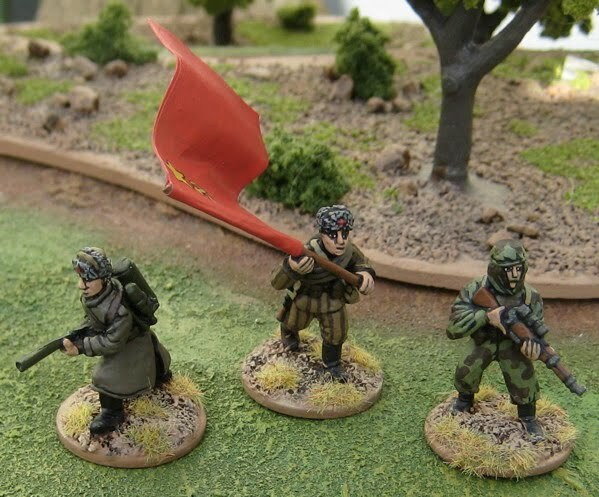 These comrades are from Bolt Action Miniatures. 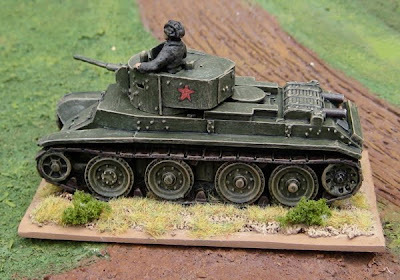 If I have to bail out a KV-2 I’m kind of out of luck… but then, how often am I ever going to field the KV-2 let alone have it hit hard enough to bail the crew!? One would think all black uniforms would be EASY. They’re not. I fretted over how to paint these guys for hours about how to give them SOME contrast?! Eventually I painted the helmets and leather jacket with Americana Charcoal Grey, the overalls I painted with a Delta Creamcoat dark grey of some sort – which may very well also have been called “charcoal” – and the boots I just left plain old black… Maybe I should have lightened up the coveralls a bit more (mixed the two “charcoals” for something in between)? I had planned to do more (some standing vs. kneeling, etc) but some recent rain (a LOT of it) has products CLOUDS of mosquitos and if I'd donated any more blood taking pictures I might have needed a transfusion myself! This is it for the Japanese… for now… but only briefly.. because… I, um… well I just picked up another lot of First Corps Japanese off ebay last night and I’m bidding on some more from Battle Honors?! DOH!? 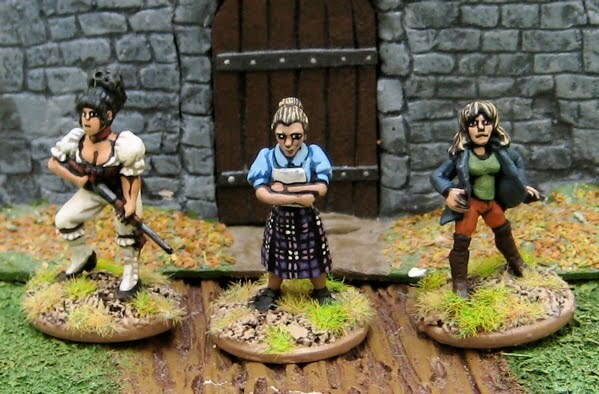 From left to right we have: a “Wild West Women” from Shadowforge Miniatures, a script girl from Pulp Figures Movie/Film Crew, and a figure that I’ve had forever and just decided to repaint (entirely) – I think I actually got her as a part of a box of Dr. Who miniatures produced by FASA…? Or Maybe GW for FASA…? I don’t know – it was 20 years ago!! Japanese… really – whole squad nearly complete, probably finish them up tonight and post tomorrow. I’m a painting fool!! There's very little else ON the painting table right now. Last week I cleared it off and decided to only have one or two project batches on the table at a time - it's really helped to stay focused on one thing. 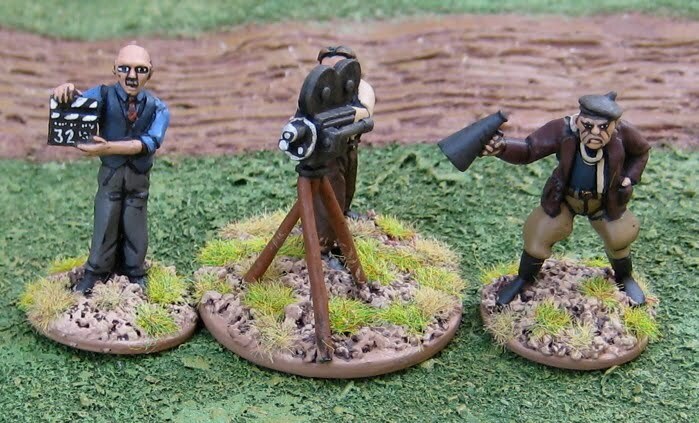 This film crew is from Pulp Figures. I’ve had them for a few years now, but just got around to them. Not sure why it’s taken so damn long – they were such a snap to paint up!? 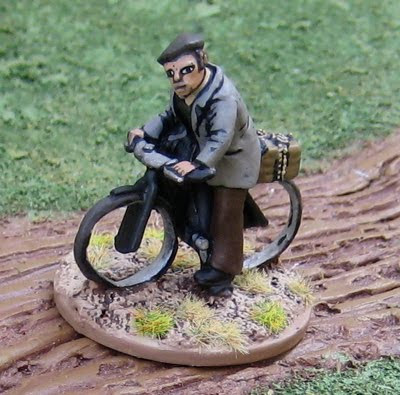 This cycliste is from a new(-ish) pack of French Civilians from West Wind Productions. Honestly, this figure is the only reason I bought the pack. (Bit of a bike geek). Oh the other figures are fine and will come in handy for something or other… but I totally wouldn’t have bought them if it hadn’t been for this chap. Japanese. Then probably some Canadians. Elves are still lurking on the painting desk… but I seem to be successfully managing to completely ignore them. I should finish off the Japanese that I have. Then I could say I have all of the WW2 in the Far East stuff I have done… Of course that’s not all that terribly much – understrength Digger and Jap platoons, and a solitary squad of Jarheads… still, finished (for now) is still finished (for now!). I would, at some point, like to add a third section of Diggers… maybe some mortars and Vickers MGs… If I went really crazy maybe I could pick up a Matilda tank… but that’d be a long way off! 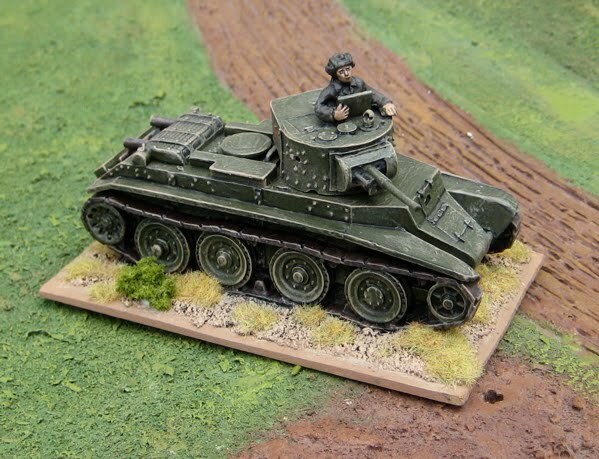 I’d pick up some more Japanese infantry before I started buying tanks for either side! Hmmmmm… Elves? Giant? Should try and do some Germans, but it’ll probably be Canucks! 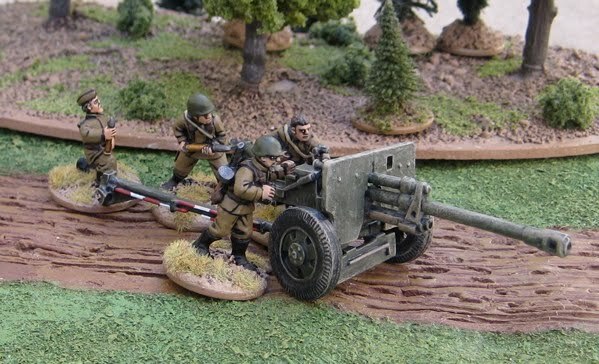 A little armoured fire support for the Heer! I had for a moment thought I’d title this post “At Last Some Elves”… just to fake out those waiting for me to get back to HOTT. But lately I’ve been looking back through the blog to find pictures of games or minis I posted over the last couple years and it’s really darn hard to find stuff when you use misleading of vague post titles! 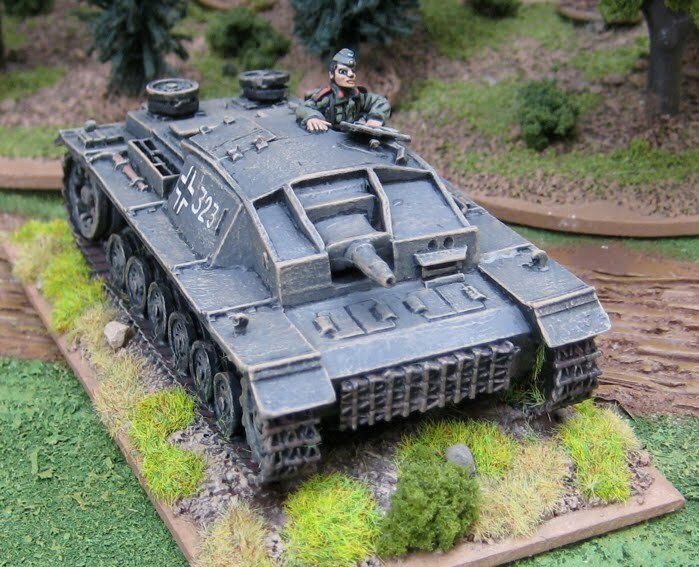 This is a Stug IIIC/D fromArmy Group North Miniatures. Nice Model. My only complaint would be that it would have been nice to have a little diagram to see where all the little bits and bobs were supposed to go. 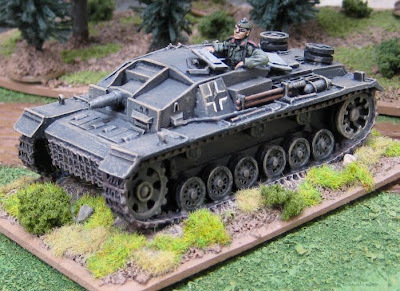 While this will be fun to bust up some Barbarossa Bunkers on the Stalin Line, I think I’d like a Stug IIIG (or two!) if I were to pick up some more. Does anyone make one…!? Did I say something about Bobbies, Diggers or Elves…? Hmmmmm…. How about some more Canucks or Commandos…!? These are all from Crusader Miniatures. I did a bit of stocktaking and organizing of the WW2 stuff and came up with a bit of a plan. I was going to publish it on the blog (thinking that if it’s “published” somewhere I might be more likely to stick to it), but then decided I wouldn’t waste the time just to bore anyone with it, and besides publishing toy plans has never stopped me from abandoning a project part way through it I stop having fun with it!! 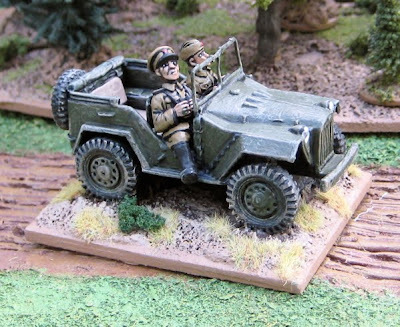 The short version of the “plan” is that I have 512 painted 28mm WW2 figures and about 268 to paint (plus about painted vehicles and two to paint – plus three more in the nefarious netherworld of “pre-painted die-cast stuff that I’m still not sure if I’m going to boher repainting them….”). If I painted 10 per week (easy) I could finish all the WW2 stuff I have by the end of the year. - Two Bren teams, two 2” mortar teams and about ten riflemen to finish off two platoons of Canadians (~18). - 3x Sherman V and a Sherman VC for a Canadian armoured platoon. 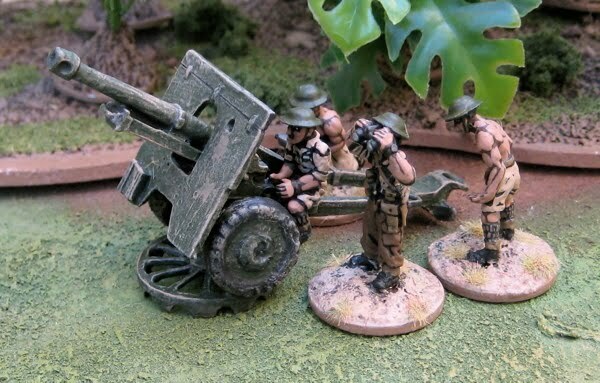 - Mortars, AT guns, Third platoon for the Canadian Infantry? - Third British Para Platoon?! Plus a company command!? 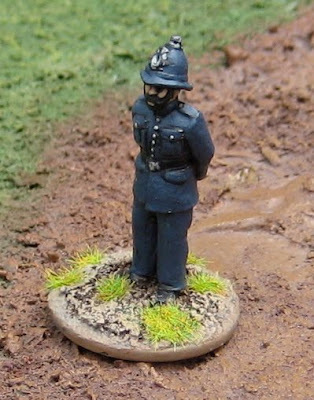 The Bobbies and Diggers are still at the front of the painting table – thought I’ve kind of been working on rebasing the last of the WW2 stuff that are still on the older, smaller washers. No really this is the LAST of the Soviets… well.. the ones that I have.. for now… (except for the bomb dog… so not really…). Also I’ve been doing a bit of stock taking of the WW2 stuff – to sort out what I have and what I really “need” (as opposed to the stuff that would be “nice to get”…). Most of the chaps with all the Stens are from Crusader Miniatures (the six in the middle). 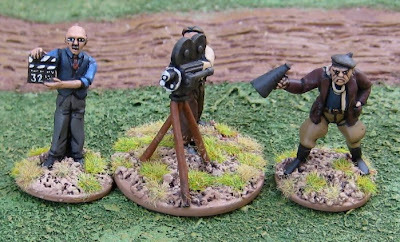 The two riflemen on the left of the picture are from West Wind Productions. 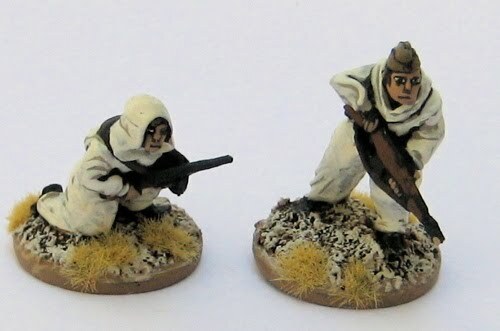 the Rifleman and radio operator (also with a sten) on the right are from First Corps (though they don’t seem to list any British/Commonwealth troops currently…). The GAZ is darn near complete (probably later this afternoon…) and the Stug is patiently waiting in the wings. 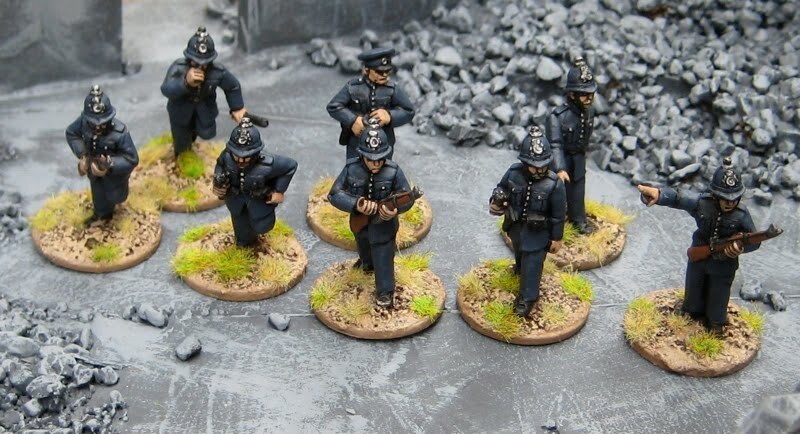 Bobbies and Diggers seem next closest to the front of the painting table, however. 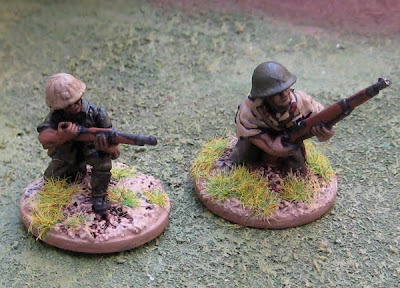 Just to switch gears a little I decided to paint up a couple of my 28mm WW2 Canucks – staying with the general era – just switching fronts. 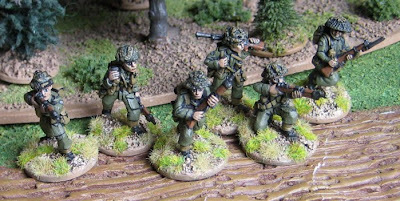 The Miniatures are mostly from Bolt Action Miniatures/Warlord Games except for the chap on the far right of the picture who is from West Wind Productions. 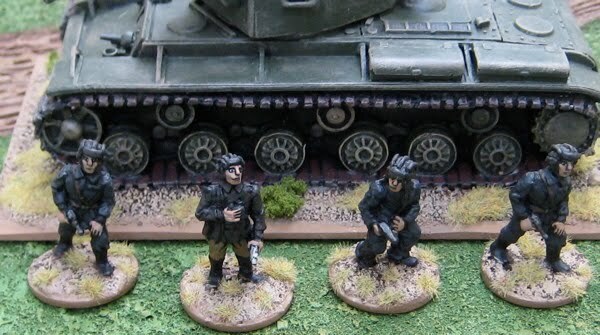 I painted them with the grey patch of 3rd Division - the ones that landed on D-Day. 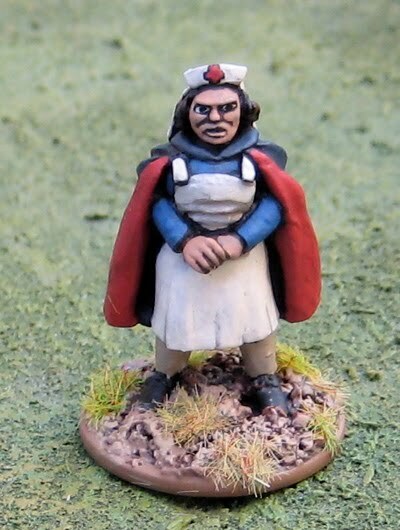 I’ve debated whether to paint a unit flash above it… Does that pidgeon hole me into using them only as members of that one battalion? Is it better to just leave the Grey patch? Should I have left the divisional patch off as well (so they could also be fielded as troops from any other Canadian formation…)? Or do a unit patch (which will be cool to point out whenever I happen to actually use them as that unit), but use them for whatever is required/desired because, honestly, NO ONE BUT ME will know the difference anyway!? 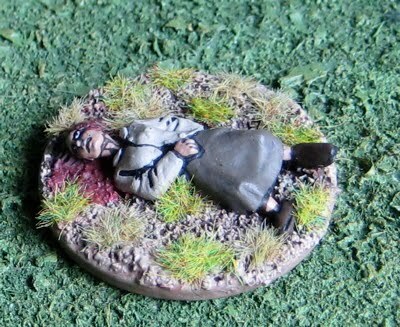 This figure is from a BTD “Resistance Casualties” pack. Should be Germans, but there’ll probably be more Canadians as I’m having fun with them. Though I have actually got the GAZ and the Stug assembled and primed, so they’ll likely be finished up soon enough. This is a BT-7 from Army Group North Miniatures. Have I mentioned that I like AGNM? I do. I’d like to get a couple more (maybe order a platoon of three for a total of four…?) at some point. That’s 132 foot (including crew), 2 guns, 4 tanks, and one armoured car. Krauts, Elves, Bobbies and Canucks… maybe some Japs and Diggers… hard to say. I “should” probably get working on some more opponents for the Russians (i.e. GERMANS) since I’m running an East Front campaign and all… I’m really having a lot of fun with it. Seems like the players are too – even though some have experienced a pretty high mortality rate! This is a Soviet 76mm gun from Crusader Miniatures. I LOVE this gun – it’s nice an chunky and SOLID – it will take a beating on the tabletop and come back for more. I seem to remember it was totally easy to put together and didn’t involve finger getting stuck together like some of the other guns I’ve assembled… but it was a while ago that I actually put it together and for some reason never got around to painting it. In fact the crew isn’t recently painted… they were painted months ago…!? But the gun is done and I’m that much closer . The BT-7… The scouts in winter gear… some Germans… Some Canadians… and some ELVES!? Few more Soviets… This is just about it. There’s just the 76mm gun, a BT-7, the six scouts I’m doing in the winter camouflage, and the GAZ (with Driver and Officer). 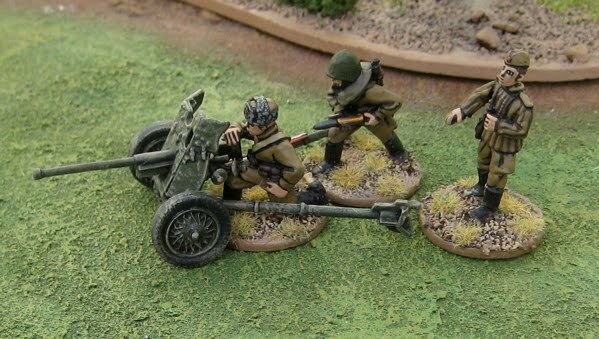 This is a Soviet 45mm AT gun and crew from Bolt Action Miniatures. 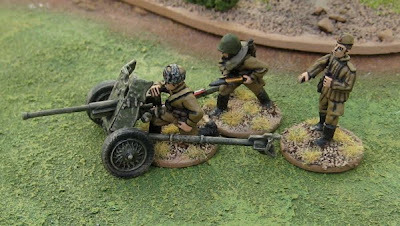 The frontnik with the flamethrower is from Battle Honors and his two comrades are from Bolt Action Miniatures. Not a soviet. 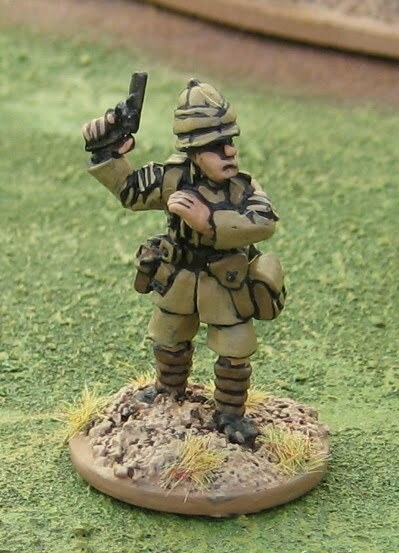 This chap is another Battle Honors figure from their Great War British in tropical kit line. 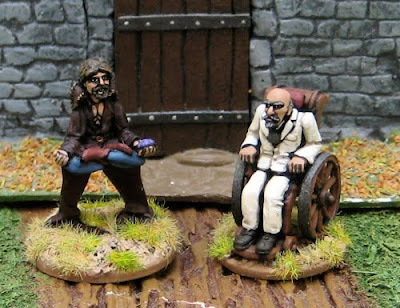 These are from West Wind Productions. I kind of like the look of them. I think I’ll paint the rest of the package in white.